I don't know what it is about Mykonos, but there is something that made me fall completely in love with it. Whether it's the white washed buildings, the stone cobbled streets or the pops of beautiful scenery - all I know is that I love it so much! 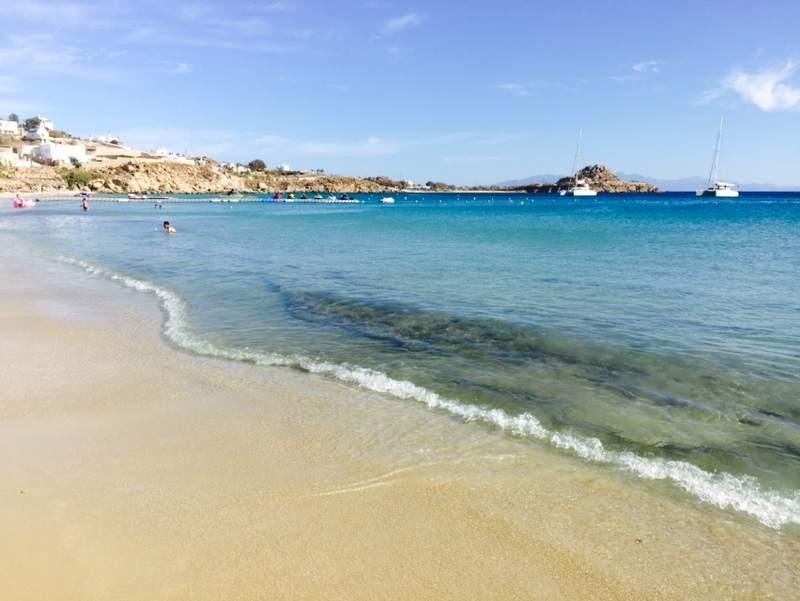 We spent 7 days staying in the Vencia Boutique Hotel near Mykonos Town. It was the perfect location with picturesque views overlooking the sea, aswell as being only a short walk into town. The pool and restaurant area had the most breathtaking view of the sunset; if you know me, you'll know that watching the sunset is one of my favourite things to do. The main reason we chose to stay here is because it wasn't too far away from where it was all happening, although it wasn't too close that we were right in the middle of the town. The hotel itself was very quaint and traditionally Greek which gave it such a cosy feel. The staff were the friendliest people and so accommodating to any needs you had, particularly the bar men who rustled up some pretty tasty cocktails! Actual heaven. The holiday itself was spent mostly by the pool, mainly sipping on cocktails, reading or pottering around the town at our own pace. We were both in dire need of a relaxing holiday because normally whenever we go away, it is FULL ON. This holiday was so perfect for that because you're not that spoilt for choice on things to do. I loved the little gift shops that merged in with the streets, how friendly the locals are and pretty everything looked. To say it was aesthetically pleasing was a huge understatement. The first few days were spent exploring our surroundings - if we didn't find ourselves by the pool, of course. First, we headed up to the famous Mykonos Windmills, had a stroll around the Old Port looking for places to eat and discovered Little Venice. Little Venice is laced with cute little cocktail bars and restaurants which look out over the sea (perfect at sunset if you can get a spot!) Obviously, there are shops too but be warned - it can be pricey, especially in high season. Thankfully, we went in low season, meaning most of the gift shop prices had been massively reduced. As for restaurants and bars, I think their prices stay roughly the same. We couldn't pass a holiday by without some kind of wild, exciting adventure! So, one day we took it upon ourselves to rent a quad bike and head down to Psarou Beach. As our hotel wasn't situated within walking distance of a decent beach, we had to find some way of transporting around the island. Because y'know, a taxi or a bus would have been waay too boring! 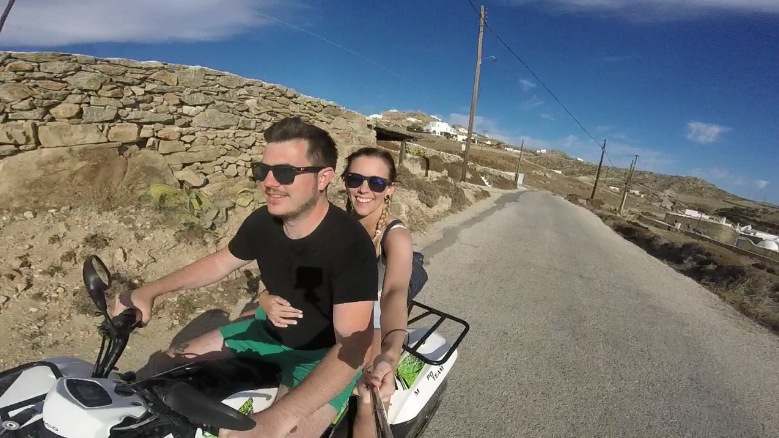 Initially, I was a little wary of getting on the quad (not knowing how crazy Greek drivers are) but turns out, they are fine! Yay for getting home alive! Psarou beach itself is literally incredible. 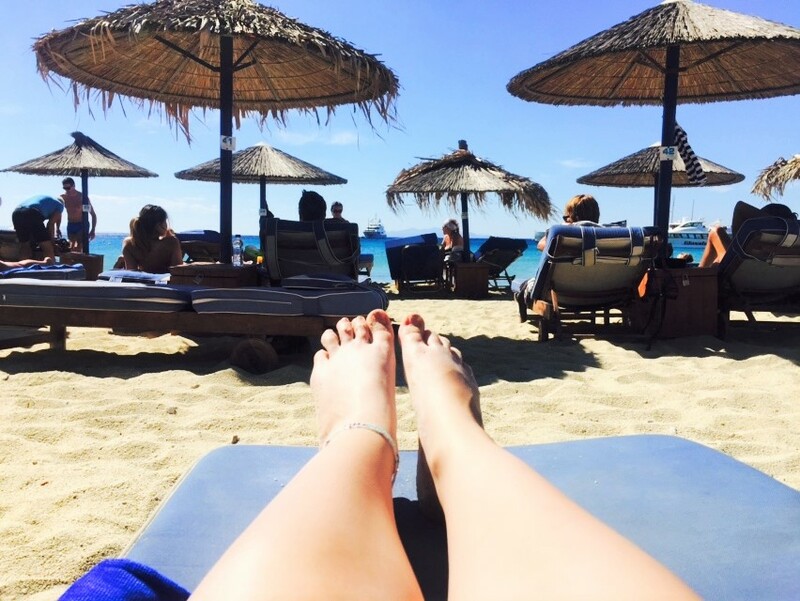 Having the warm, golden sand beneath your toes and the clear, turquoise waters - you literally couldn't ask for anything more. As much as I wanted to check out Super Paradise beach, we didn't want to be involved in huge crowds of drunk people, so Psarou beach seemed like the perfect inbetween. You can enjoy a cocktail (or five) whilst soaking up the sun, with some music echoing in the background. It's not the quietest beach, unless you are nearer to the end but it was very beautiful. Eating out was the hardest part for us. You are absolutely spoilt for choice in the town with all different kinds of amazing looking restaurants. Honestly though, I think we only ate at one bad place - well, unsatisfying. Having breakfast included at our hotel (the biggest spread may I add) we only really needed to head out for dinner. I could have lived off of Greek Salad's with all the bread and dips, they were SO GOOD. 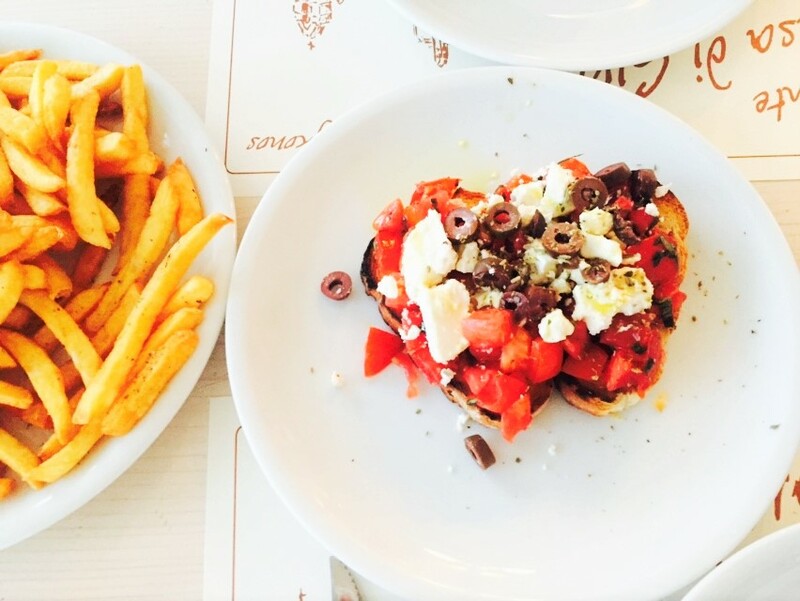 If you are new to visiting Greece, you HAVE to try Gyros. They are bloody delicious! For dessert, pretty much every night we found ourselves a Crepaland for a Wafflino covered in melted chocolate praline - the thought of it again is making me salivate! 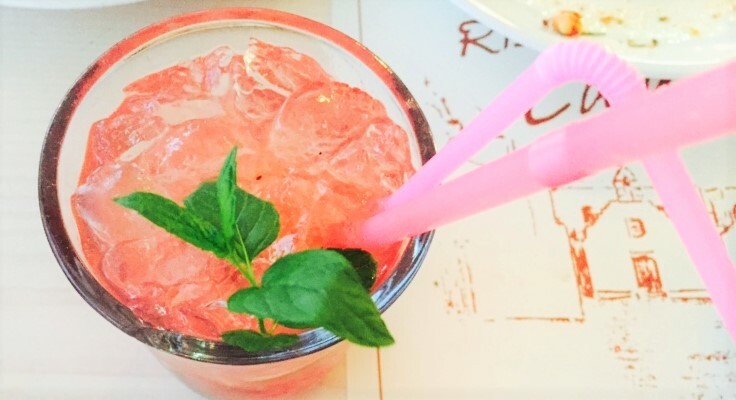 As for drinks, I could have willingly drowned myself in Strawberry Mojitos. All of the yum! Whilst we still had the quad, we took it upon ourselves to go and visit the lighthouse. It was only about a 15 minute drive away from our hotel, so no biggie. It is so beautiful and the views are stunning, but it was literally SO windy and cold that we didn't end up staying very long at all. Minus the wind, it is so peaceful up there. I wish we were warm enough to stay for sunset! I will never forget our trip away to Mykonos. It has to be at the top of my list with one of the most beautiful places I've ever visited. I'm already missing the Mykonian sunsets, indulging in cocktails at any time of the day (because that's acceptable), soaking up the sun and just damn right chilling. Personally, late September was the best time of year for us to go. It's not too hot/busy and everything just moves at the pace you want it to. This has definitely spurred me on to want to visit more of Greece and the islands! A week went far too quickly, but I think it was just the right amount of time there. If you'd like to see a travel guide, I'm more than happy to do one. Let me know! So glad you got a chance to RELAX! everything is so so so beautiful! I think the picture of you and Jack on the quad is my favorite haha.